"In 1920 'Crazy Blues', the first blues recording by a black singer, was released. The song was composed by Perry Bradford, a black songwriter, bandleader, and promoter with a background in vaudeville who had moved from Alabama to New York, the capital of America's entertainment, music-publishing, and recording industries. Bradford persuaded Okeh Records, one of the smaller companies that there was a market for blues in the black community. He would supply the song and the singer, Mamie Smith -- a Cincinnati-born vaudeville veteran who performed a wide range of material that included blues -- and would organize the Jazz Hounds to back her up. "One of the first great folk-blues performers to be recorded came from Texas. 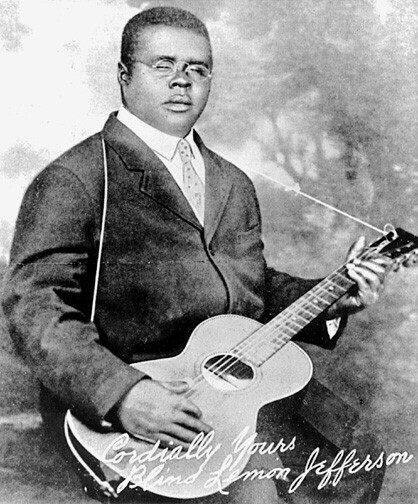 Singer, guitarist, and composer Blind Lemon Jefferson recorded nearly a hundred blues songs between 1926 and 1929. Jefferson had a strong voice that easily traversed his two-octave range; he attacked his guitar with long staccato runs of notes, almost constantly improvising and varying his performances. He sang about railroads, liquor, jails, violence, extreme poverty and wild women, displaying a gift for startling themes and novel imagery that seemed to belie his blindness. Growing up in rural poverty in Wortham, Texas, Jefferson performed for tips on the streets of Dallas; by the height of his recording career he was traveling around the South in a chauffeured sedan, having become a household name in much of black America. "Jefferson's success opened the door for many other blues singer/guitarists to record in the late 1920s and on through the 1930s, and he set an almost unapproachable standard that raised the level of performance throughout the genre. Among the many guitarists he influenced was Huddie Ledbetter (Lead Belly) who performed several of Jefferson's songs throughout his career. Jefferson's playing would also amaze and inspire such solo performers as Lightnin' Hopkins who would adapt a somewhat simplified version of Jefferson's guitar style to the electric guitar in the 1940s, and T-Bone Walker, would add more complex, jazzy harmonies to Jefferson's foundation, applying it to the electric guitar as a lead instrument in a blues band. As a youth, Walker had been Jefferson's 'lead boy' in Dallas, and from the 1940s onward, Walker directly or indirectly influenced almost every lead guitarist in a blues band."